In a DCU, the CMUs and I/O components communicate directly with each other through the midplane. The midplane isolates DCUs from other DCUs in the server. DCUs do not connect with each other directly, but scalability hardware permits DCUs to connect indirectly. The following figure shows the scalability hardware. 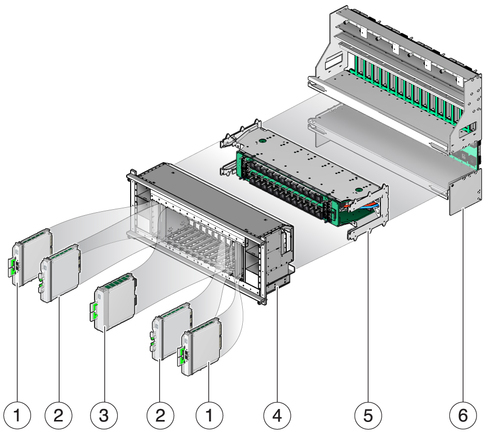 Data signals from a DCU cross the midplane and scalability cage to the scalability card cage, where SSBs switch the data signals back through the scalability assembly and the midplane to other DCUs. Note - If the scalability feature is not enabled, the SSB LEDs turn off. This is normal behavior for SSB LEDs on the scalability card cage.